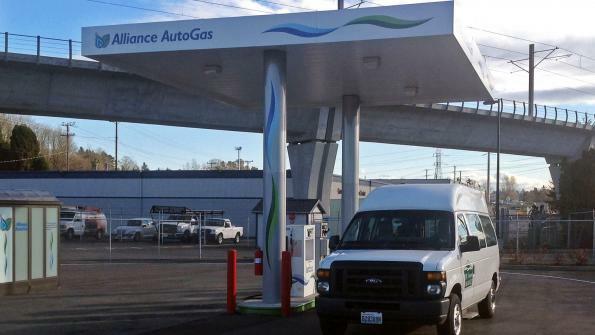 A public network of propane autogas stations boosts alternative fuel use in western Washington. Jurisdiction: Puget Sound region, Wash.
Fleet vehicles that need to refuel while on the road can find propane autogas refueling stations in every state, with many more public sites opening every day. 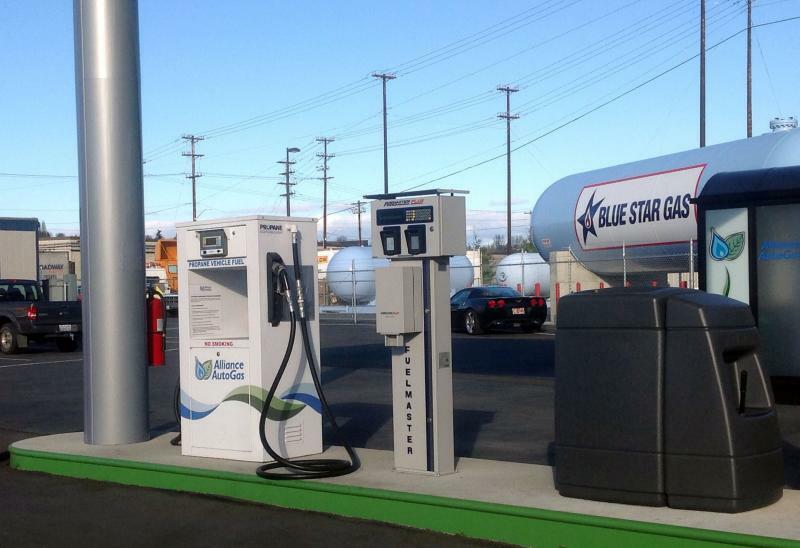 The Blue Star Gas/Alliance AutoGas refueling network is the largest single installation of alternative fuel infrastructure in the Pacific Northwest, with 11 stations serving more than 400 propane-autogas-powered vehicles from about two dozen fleets. Customers can use the pumps 24 hours a day via a card-reading system, which lets fleet managers track fuel savings and miles-per-gallon usage. The project has fostered a steady rise in alternative fuel fleet adoptions in the area by removing a common barrier: lack of infrastructure. The impetus for the project came from the 2012 installation of a propane autogas refueling site for Seattle Children’s Hospital’s fleet of 15 bi-fuel propane autogas shuttles, according to Darren Engle, director of government relations for Blue Star Gas. Space and zoning issues prevented the hospital from building infrastructure on-site, prompting Blue Star Gas to establish a public refueling station less than a mile away. The stations have helped many fleets expand their ranges of operation because they’re no longer limited to on-site refueling facilities, according to Engle. That’s especially beneficial to high-mileage operations like medical paratransit, shuttle services, law enforcement and delivery. Blue Star Gas and propane industry consortium Alliance AutoGas to coordinate closely with local agencies to ensure the sites met diverse permitting and planning codes in each community. The team also worked with local fire marshals to certify the sites adhered to National Fire Prevention Association and industry standards for propane refueling facilities. More than 500 propane autogas vehicles are projected to be using the network by the end of 2014. The 11th station in the network is slated for completion in July, according to Engle. Additional sites will be added as fleet adoptions increase and demand grows.